This Cabin is a one of a kind river front getaway. 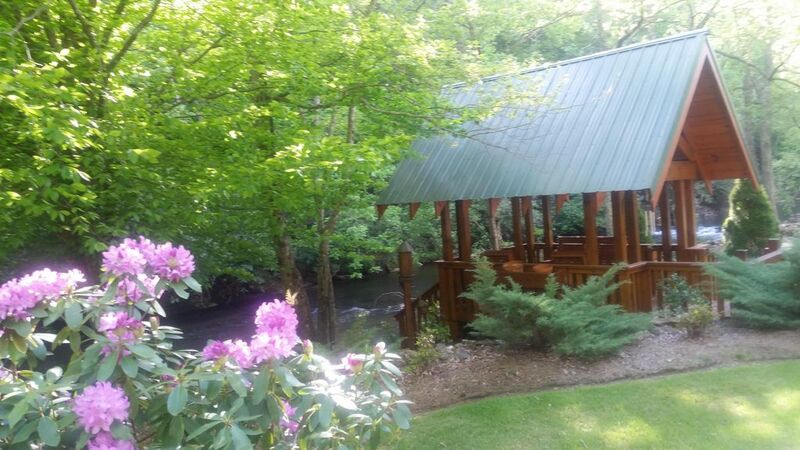 Relax on the Large comfortable porch, overlooking a broad mountain river. It sleeps 2. 4 upon request. Dogs under 25 lbs are welcome with a $50.00 non-refundable pet fee. Let the sounds of nature sooth away your stress. This experience you will never forget, allow the slow paste a small town take you back in time. Enjoy great food at the local restaurants, listen to bluegrass at the local dance hall and dance the night away with friendly folks. This cabin has all the comforts of home. The Bedroom is large with a clean, comfortable queen size bed. It has central heat & air and gas fireplace. Granite tops and stainless steel appliances. There is a small out door barbecue, and a rock fire pit next to the river and fire wood. There are lounge chairs in the out door storage to enjoy sitting by the river. You can also fish off the river front deck. We have a large flat screen TV with over 150 movies to watch. The bathroom is spacious with a large stackable washer and dyer and a walk in shower. We have clean towels and sheets or you can bring your own. The Kitchen has all the dinning wear you will need and a dishwasher. Just bring your self and enjoy. There are many books though out and games in closet. Enjoy a long hike or take a day trip to Stone Mountain Park, only 20 minutes away. There are 2 grocery stores in town and several quaint coffee shops. This retreat is very private, yet only 5 minutes from town. There is also a hospital close by. Don't delay, book your getaway in the Blueridge mountains today. We were both born in Cuba. Came to the US at a young age. Both grew up in Miami and met here in beautiful NC. We live in the small bedroom community of Kernersville NC. Since I can remember, I have longed to be by a river. I know that when I am near the feel and sound of a river, there is something so healing and calming that words cannot describe. So when the opportunity presented itself, we felt like this place was a God send. We cherish every moment we spend at the cabin and would one day retire here. This is truly a little piece of Heaven. I love the front porch swing, and how it feels to just sit there. Every season bring with it a different feel. The river is spectacular with its ever changing flow. There are large mature trees overlooking the river on the mountain side. Sometimes the wind flows in such a way that you can hear nature talking to you. Wildlife is abundant. I love the decorations on the front porch. Clean with a walk in shower and a stackable waher and dyer. Heat pump and a extra standing ceramic heating in bedroom closet for added comfort. Gas logs in living room for extra comfort! parking is in front of cabin. Directly Under the Cabin. The information for the WiFi is located inside the cabin. New stainless steel flat class stove. Lots of dishes and Utensils along with baking pans and all the Utensils you could need. Good size Kitchen with pots and pans, blender, small crock pot, microwave, oven, frig, toaster oven, sandwich grill, coffee maker etc. Large, spacious wrap around porch, overlooking the river. There is not a ramp, only stairs! There is a full size sofa bed in the living room with a comfortable memory foam mattress which can sleep 2. Thank you for taking time to do a review. We are so glad you enjoyed your stay and look forward to return visit. From the moment of booking Ena was amazing. She reached out early to provide fantastic information to allow us to plan the perfect getaway, her directions were spot on and the property was a slice of heaven. The sound of the river was so relaxing we kept the doors and windows open just to listen. The kitchen is well stocked with all the cookware and dishes you would need, lines for the bed and bath and she covered every detail down to even toiletries in case you forgot something. Sparta is nearby for any grocery shopping. There is an amazing library of DVD's and books as well as Direct TV and WiFi. We will definitely be back. We are delighted that you have a wonderful stay at our cabin. Thank you for taking the time to write a review. We truly appreciated it. Definitely we look forward to having you back and hope to make it even better! We were glad that we read all of the excellent reviews and couldn't agree more. Ena was very helpful & accessible with some of our questions. The cabin was clean, nicely decorated, well stocked & smelled good also. It was very quiet & peaceful while we were there and we spent a lot of time on the front porch just enjoying the sounds of the river. We brought our own supplies since we drove but found that everything was very well stocked. The bed was comfortable and the bedroom was roomy. The only things I might recommend are a night light for the bathroom and maybe a binder with area restaurants & attraction brochures. We would definitely recommend this cabin to anyone considering staying here. Thank you for taking the time to do a review. We appreciate the detail and how it helps our potential quest to make a decision on whether to choice us over another rental. We welcome any tips on making it even better. Hope to see you back in the future. We were very pleased to have found this cabin as it was so convenient for us to carry out our tasks in Sparta. It was extremely quiet and peaceful. Being close to the river made it very relaxing and calming particularly to sleep at night. My husband and I liked the coziness as it was just the right size for two people. If you ever go anywhere, go HERE!!! This place is like stepping into a lovely novel. One can't truly describe it. PRIVACY, ahhh. It is so clean and smells so nice. The cabin is spacious and modern, like, I want to live here. I took one of the chairs from the shed and placed it in the river and fished with my feet in the cool clean water (caught a trout which was delicious). I will be back. Oh, and just bring your toothbrush, clothes and food. This place has everything else. Bed was very comfortable. One thing, I have a Galaxy 7 and had no phone reception but could text. Just FYI, I discovered that I could make phone calls via facebook messenger (but it was great not having my phone ring off the hook). I'm a nurse and I will be back if they'll have me!!! Thank you for taking the time to do a review. Wonderful to hear you have a memorable stay. We certainly would love to have you back.....the trout will be waiting for you! The cabin is equipped with everything you need. The location is private, but only a 10 minute drive to town. This was our 3rd stay and cannot wait to return. Thank you for your loyalty. It's a pleasure to see our cherished quest return again. Enjoy the beautiful town of Sparta with its small town feel and friendly people. Open clean mountain air. With wildlife and rivers to help ground you and sweep away your stress. Go dancing at the local Bluegrass dance hall. Or bowling at the Rock River Caffe. Worlds best burgers. Great places to eat and beautiful surroundings. Massage service is available. Rates are $75 per hour or $110.00 for hour and half. $150 for two hours. This includes all modalities.